Hawk Paint Sprayers LP | Hawk Research Laboratories, LLC. 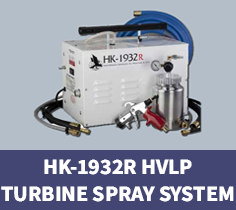 The HK-1932R spray system is designed to spray a wide variety of coatings, including high viscosity coatings such as StoneFlecks™ Ultra and other water based multicolor coatings. 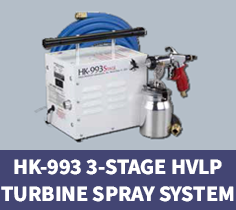 This 3-stage turbine spray system is ideal for higher viscosity coatings, including high solids coatings and performs well with the StoneFlecksTM Ultra multicolor product line. The turbine delivers 61.5 CFM at 3/4 inch restriction and 6.0 PSI measured at the air cap using the standard 2-foot hose. This turbine is lightweight, weighing only 18lbs. 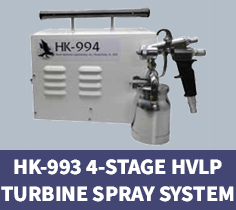 Due to the quality of the motor and its proven reliability, the HK-993 3-stage spray system comes with a factor warranty with registration. Call for details. 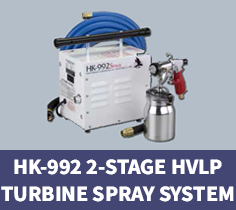 This HVLP turbine spraying system features a higher atomization pressure of 7 PSI at air tip, which allows the spraying of latex paint, multicolor and more viscous types of paints that cannot be reduced.